When I give wine as a gift, I like to dress it up a little bit. The stamp set Half Full lets you do just that, and very easily. I stamped the sentiment that is framed beautifully, then I punched out the top part using the Scallop Tag Topper Punch. (It does take a little fussing to stamp the top of the image just the right distance from the edge of your card stock ;-) I cut off the bottom edge and trimmed the sides along the stamped lines. I tied a bow using the Basic Black Shimmer Ribbon. Next I created a card to place the tag onto. It's a Fresh Fig card base with a piece of Whisper White down the middle. The top layer is a piece of the Merry Music Specialty DSP (back side) that is trimmed with Black Vintage Crochet Trim. I think it makes a handsome card/tag. Thanks for coming by today! 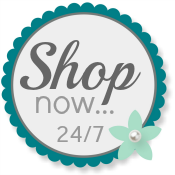 Please shop with me at my Online Store any time! I'd love to read your comments, too!